You look, you die. Such is the premise behind this dystopian Netflix survival thriller, adapted by Oscar-nominated screenwriter Eric Heisserer (Arrival) from the 2014 novel by Josh Malerman. Told through a series of flashbacks, Sandra Bullock is Malorie, a pregnant Michigan woman who survives “The Problem” – no, not her unplanned pregnancy, but rather, a mysterious, mass extinction event in which those who see an unknown entity suddenly kill themselves, typically in epic fashion. Five years later, a blindfolded Malorie is trying to row her two blindfolded children down a raging river to a refuge that she has been told about. So many blindfolds, yet so many loopy plot potholes to navigate! Let’s go! Given that such a well done novel is saddled with such a sloppy screenplay adaptation, Susanne Bier’s direction is more suspenseful than would be expected. 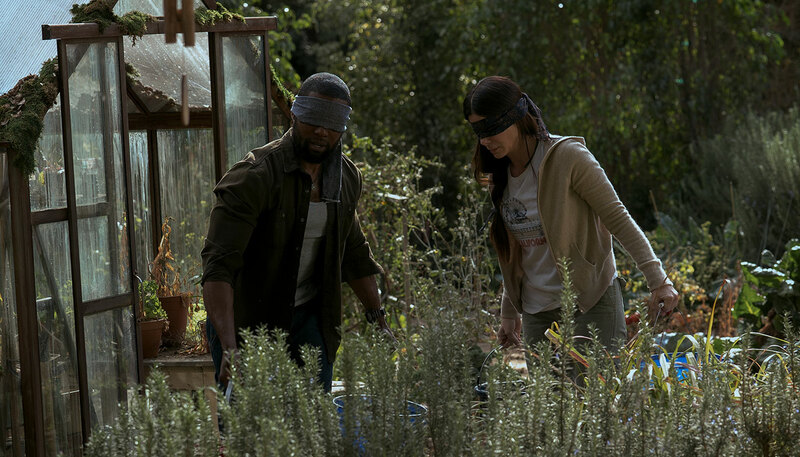 But Bird Box suffers from a “been there, done that” vibe that falls somewhere between M. Night Shymalan’s disastrous 2008 hot mess, The Happening and 2018’s way more thrilling A Quiet Place, in which sound, not sight, is the conduit to mortal danger. It is Bullock alone who makes this film worth seeing, aided by a strong supporting cast – some of which we see plenty of – Trevante Rhodes (Moonlight), John Malkovich and Danielle Macdonald (Dumplin’, Patti Cake$); and some which we don’t – namely, Sarah Paulson and Jacki Weaver (Widows, Animal Kingdom). It’s just a shame that the interesting premise never quite makes it out of the dark. Next Second Act: J-Lo Returns to Her Comic Roots… But Is It Funny?